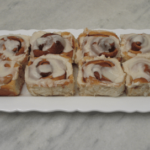 A recipe for old-fashioned cinnamon rolls with vanilla icing. The rolls are light, fluffy, and filled with brown sugar and cinnamon. Grease a large bowl and set aside. Lightly grease a 10 x 13 baking pan and set aside. In the bowl of a stand mixer, whisk together 1 1/2 cups flour, yeast, 1/4 cup sugar, and salt. In a saucepan, heat milk, water, and 1/4 cup slices of butter until 120° to 130°F (I use a candy thermometer and heat to 125°F). The butter does not have to melt. Add the warm milk/water mixture to the flour/yeast mixture. Stir with a wooden spoon to combine. Put the bowl on the mixer and mix using the flat beater on medium-low speed for 2 to 3 minutes. Change flat beater to dough hook. Add flour 1/2 cup at a time until the dough starts to climb the dough hook and the sides of the bowl are “clean”. It will be a soft dough. Turn dough out on a very lightly floured surface and hand knead a few times. Shape dough into a ball and place in greased bowl. Turn dough over to coat it on all sides. Cover very loosely with plastic wrap (do not attach plastic wrap to top of bowl, only cover the dough a bit). Let dough rise in a warm place until it has doubled in size, about 1 hour. Combine brown sugar, sugar, and cinnamon in a small bowl. Melt the 3 tablespoons of butter just before dough is completing the first rise. Set aside. Once dough is doubled in size, punch down dough. On a lightly floured surface, roll dough out to a 15- X 12-inch rectangle. Pour melted butter over dough and spread out using a pastry brush. Sprinkle cinnamon/sugar filling mixture over butter. Starting with the shorter side, roll up tightly. Pinch edge to seal. Cut into 12 slices. Place slices into prepared baking pan. Cover with a tea towel and rise until almost double, about 30 minutes. While the rolls are on the second rise, heat oven to 375°F. Bake rolls for 20 to 25 minutes until golden brown. Combine powdered sugar, melted butter, vanilla, and enough half-and-half until mixture is smooth and pourable. Pour or drizzle over rolls when they are hot out of the oven.